A plica is a band of soft tissue on the inside lining of the knee. The plural of ‘plica’ is ‘plicae. Plicae are common inside the knee, and are probably the remnants of sheets of tissue in the knee from when the knee was growing as an embryo. The most common plica to cause issues inside a knee is a medial plica (on the inner side of the knee). 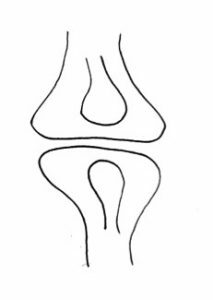 Other possible plicae are a lateral plica, a medial suprapatellar plica, a lateral suprapatellar plica, a suprapatellar septum, and a ligamentum mucosum. The fat pad at the front of the knee can also be involved (with thickening and inflammation), as this is normally attached to any medial plica and/or ligamentum mucous. If a plica is small then it is irrelevant. It a plica is big/thick but you’re a couch potato then it’s still irrelevant. However, if you’ve got a big/thick plica and you do a lot of exercise then the plica can rub inside the knee and become inflamed. When there is an inflamed plica that is causing symptoms, this is called ‘Plica Syndrome’, with Medical Plica Syndrome being the most common. Plica Syndrome causes a burning pain in the knee (in whichever area the actual plica is) that comes on specifically with exercise such as running or cycling. Most people are normally fine when they start exercising but the symptoms then come on after a certain time or distance. The pain often persists directly after exercise but then gradually eases off with rest. It is important that your knee is checked properly, to make sure that there are no other potentially more serious underlying problems causing the symptoms. The best investigation is an MRI scan. This normally shows if a medial plica is present, but it will not tell you whether this is just coincidental or whether the plica is actually symptomatic, i.e. plica syndrome. Steroid injections can temporarily help improve symptoms, but tend not to be an actual cure. If the symptoms are bad enough, then the proper treatment is to have an arthroscopy. This allows the whole of the inside of the knee to be checked thoroughly, and then whatever plical tissue is found can be excised easily, with a tiny shaver. Recovery from this surgery is normally quick (about 6 weeks) and it usually completely cures the problem. For some reason, most people (including many healthcare professionals) don’t actually seem to know much about Medial Plica Syndrome, and some won’t even have heard of it! Medial Plica Syndrome is a slightly difficult subject — the symptoms tend to be rather vague and slightly non-specific, it is very difficult to diagnose with imaging such as MRI, it tends to be somewhat of a diagnosis of exclusion and definite confirmation of the diagnosis is sometimes not achieved until after actual surgery to remove the plica. A plica is a shelf of tissue on the inner (synovial) lining of the knee. When the knee joint is forming, when you are an embryo, it starts off as two separate compartments, each with a rudimentary bone in it. These compartments then fuse together and the sheet of tissue in between shrinks back to form one single joint compartment, containing the end of the femur and the top of the tibia. In some people (about 15% of the population) one or more bits of this shelf of tissue fails to shrink back fully, leaving a band or shelf of tissue on the lining of the knee – a plica. 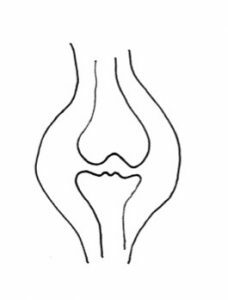 Most plicae are on the medial (inner) side of the knee, just medial to the medial border of the patella. Plical tissue is often associated with thickening and inflammation of the Fat Pad, the cushion of tissue that sits behind the patellar tendon. Also, some people have a band of tissue at the front of the knee that runs from the fat pad to the top of the front of the intercondylar notch, in front of the ACL, and this is called a Ligamentum Muscosum. 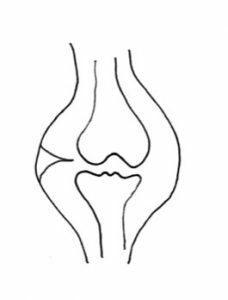 The next most common place to have a plica is just above (superior/proximal) to the patella. If this extends just part way across the so-called supra-patellar pouch then this is called a supra-patellar plica. 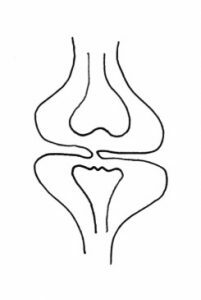 If a sheet of tissue extends all the way right across the top of the supra-patellar pouch then it is called a supra-patellar septum. Finally, some plicae are found on the anterolateral (outer) side of the front of the knee, but these are far less common. As your knee is developing as an embryo, the joint starts off as two separate compartments. The two compartments then start to fuse together and the shelf of tissue in between shrinks back. By the time that your knee is fully developed and you’re born, the shelf of tissue has shrunk back fully and the joint is now one single compartment with a smooth inner lining. In about 15% of people, one of more shelves of synovial tissue fails to shrink back fully, leaving a shelf or band of tissue on the inner side of the knee that rubs with repetitive movements such as running. If it rubs too much then it becomes inflamed, and this is ‘Plica Syndrome’. If you have a plica and it is small, then it is likely to be irrelevant. If you have a large thick plica but you’re a couch potato, then it’s also likely to be irrelevant. If, however, you have a large thick plica and you do a lot of exercise (particularly running, but also sometimes from cycling) then with repetitive flexion/extension (bending/straightening) of the joint the plica may rub on the edges of the inside of the knee (in particular, a medial plica tends to rub on the medial edge of the medial femoral condyle). If this rubbing continues then the plica will become inflamed. Plical tissue (like the rest of the synovial membrane lining the inside of the knee) is rich in nerve fibres, and if a plica becomes inflamed then it will cause pain in the knee in whichever location the plica is found. A plica can therefore be considered as a little like an appendix — if it’s not inflamed then it’s irrelevant. If it’s inflamed then it can cause appendicitis. So, if a plica becomes inflamed then it can cause ‘Plica Syndrome’ – and the most common version of this is Medial Plica Syndrome. There are plenty of other things that can cause pain in a knee with exercise, and before making a diagnosis of probably Medial Plica Syndrome, the first step is to exclude other other potential causes such as meniscal tears, articular cartilage damage or tendinopathies. This normally requires imaging with MRI scans and possibly Ultrasound scans too. Thick plicae often do show up on MRI scans, if you know what to look for and if you look carefully – although they can be missed by some people. 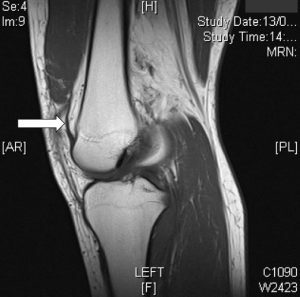 However, even if a plica is seen and if there are no signs of any other significant pathology in the knee, this still does not guarantee the diagnosis of actual Plica Syndrome. If a patient’s symptoms are in keeping with possible Medial Plica Syndrome and if any other potential pathology has been excluded, if a plica has been seen on MRI, if a patient has tried appropriate non-surgical treatments (such as rest and physiotherapy) and if a patient’s knee symptoms are actually bad enough to necessiate it, then the next step is to proceed with an arthroscopy. At knee arthroscopy the whole of the knee joint is inspected carefully and any damage to any structures that is found is dealt with. If thickened/inflamed plical tissue is found inside the joint then it can be excised very easily using an arthroscopic shaver, and the bleeding blood vessels can be coagulated using a radiofrequency probe. 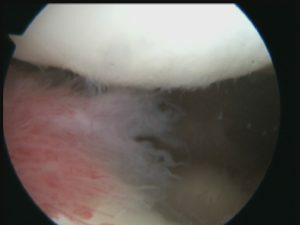 This is an arthroscopic (keyhole) view of a knee with a very inflamed medial plica (= the red wispy tissue coming into the picture from the left side, which is sitting between the back of the kneecap and the front of the medial (inner) side of the medial femoral condyle of the front of the femur). This medial plica was so large and thick that even an arthroscopic shaver wasn’t powerful enough to get rid of it…. The plica ended up needing to be cut with a meniscectomy punch before the remainder of the plical tissue could then be removed with the arthroscopic shaver. After surgery, we normally advise patients to take things easy and just potter around for the first week or so before then starting regular physio rehab treatments (a couple of times a week for the first few weeks). Most patients recover fully within about 6 weeks at most. If a plica is found in the knee, if it is excised, if the patient then has rehab and gives their knee time to settle down and if their symptoms are then cured … then, and only then, can one be certain of the definite diagnosis that the patient did actually have Medial Plica Syndrome. Does a plica ever grow back? People often ask whether a plica can potentially re-grow and come back after surgical excision. This is something that is extremely unlikely and a thankfully not something that I have personally ever seen before. The good thing about having Medial Plica Syndrome is that of all the things that you can have wrong inside your knee that are actually bad enough to justify surgery, this has got to be the best … because it’s one of the easiest things to deal with and a plica has no biomechanical function inside the knee joint, and so excision of a plica has no adverse long-term consequences for the joint. CLICK HERE to read Nicholas Dodds’ story about his medial plica syndrome.